Eddie Lynam is keen to give Slade Power the chance to stamp himself the world's best sprinter in Australia later this year after he continued his fantastic summer with a brilliant display in the Darley July Cup at Newmarket. Given a nice lead into the race by Spanish raider Noozhoh Canarias on the far side of the track, Wayne Lordan's mount was ridden to lead entering the final furlong and was well on top as he passed the post a length and a half clear. Tropics, a 66-1 outsider, ran a massive race to fill the runner-up spot for Dean Ivory, with the John Gosden-trained Gregorian finishing strongly to grab third ahead of American runner Undrafted. Haydock's Betfred Sprint Cup on September 6 looks likely to be Slade Power's final appearance in Europe before he is prepared for his trip Down Under, where he will bring down the curtain on his racing career before taking up stallion duties. Lynam said: "Stupidly I watched the race on the inside of the track and I couldn't see anything. They were all just running up in a blur, but I knew he was up in the front of the pack and I'm delighted with the result. "I've always spoken of him very highly and thought he was very good. "I'm looking forward to taking him to Melbourne. The last race of his career will be in the VRC Sprint in Melbourne in November. "I think today he's proved he's the best sprinter in Europe and the obvious step now is to try and make him the best sprinter in the world. What better place to go than Australia and try to beat them on their own patch? It won't be easy, but we'll give it a go. "Ideally, we've about eight weeks between now and Haydock and then eight weeks between Haydock and the VRC Sprint. "Haydock is a maybe, nothing else." Ivory was rightly thrilled with the effort of Tropics. He said: "I'm absolutely over the moon. It doesn't get much better than this. It was a phenomenal run. "The way this horse won his Group Three last year, there was so much more to come but the yard just took a long time to get going this year. "We had a bug in the yard and one thing and another, but we've come through that and the horses have started to run a lot better. "You've got to keep believing in them. You've got to keep getting up every morning and say 'there's more to come'. "We will now sit on it for a little bit. 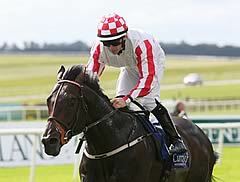 He is in the Haydock race and the big one at Ascot on Champions Day. We will find our way through the calendar until the end of the year. "He is a better horse in the autumn and I would like to send him abroad then." Gosden was left to rue what he felt were traffic problems for Gregorian. He said: "He didn't have a good run and he got shut off and he was forced to come down the middle of the track. He finished very strongly and should have finished a solid second. I am not saying he would have won but he would have given him a good fright." The Wesley Ward-trained Undrafted is owned by American football star Wes Welker, who said: " It was a great effort as he was up against great horses in this race. The sticky ground was not ideal for him but I was happy with the outcome."